If you have been following media and social media of late, it would be easy to conclude that the discussion around coal seam gas is an “us versus them” debate, with resource companies on one side and those wanting to protect the environment on the other. Santos has a proud 60 year history of working safely and sustainably and we are absolutely committed to the environmentally responsible development of Australia’s natural gas resources. The strong and lasting relationships we have built with farmers and communities across the country are proof of this. Natural gas has about half of the emissions of coal and complements the shift to renewables like solar and wind power by providing essential energy when the sun goes down or the wind stops blowing. In NSW, Santos’ proposed Narrabri Gas Project has the capacity to supply up to half of the natural gas used in NSW homes and businesses each day. This is the energy used for cooking and heating, for generating electricity and to fuel the industrial processes that produce essentials like food, medical supplies, steel, bricks, glass and even fertiliser. It’s estimated that the jobs of more than 300,000 workers in NSW rely on an affordable supply of natural gas. While developing this natural gas is critical for our economic future, it is equally important that we do so without impacting the environment. Santos goes above and beyond to ensure we do not have an adverse impact on the environment and the regulations we adhere to in NSW are among the most stringent in the world. Following a comprehensive 18 month review of the industry, the NSW Chief Scientist, concluded that with appropriate safeguards and controls, natural gas from coal seams can be safely extracted. The part of the Pilliga in which our Narrabri Gas Project is located, was set aside by the NSW Government for forestry and extractive industries like natural gas development following a thorough ecological assessment – the Brigalow Nandewar Agreement. The section of the Pilliga in which we will work is not pristine forest. It is land that has previously been and continues to be used for industry, including timber harvesting. Our project area is largely dry scrub land and is outside the sections of the Pilliga protected under the National Parks and Wildlife Act. We know the ecology of our project area very well. 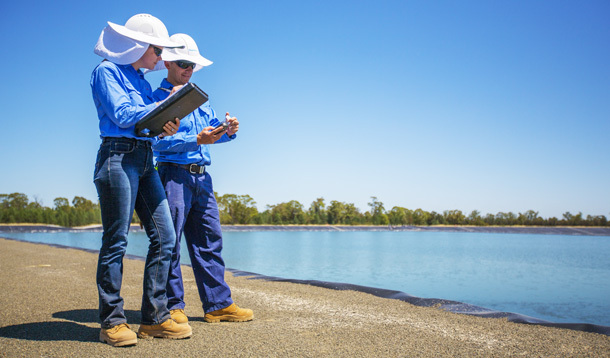 For the development of our Environmental Impact Statement for the Narrabri Gas Project, we have drawn upon the more than 13,000 hours of on the ground environmental studies. This work has been carried out in conjunction with scientists who are experts in their fields. These surveys assessed water, flora and fauna and cultural heritage and have significantly enhanced our understanding of the area, so we can best manage any impact. The protection of water resources is often raised in the CSG debate. We know how critical water resources are to farmers and communities and protecting all water resources is one of our upmost priorities. We have used the best available science to build a regional groundwater model and provide a comprehensive understanding of any potential effect our work near Narrabri might have on local water. The CSIRO peer reviewed our model and they described it as, “state of the art and suited to assess potential impacts of water extraction for coal seam gas depressurisation on the surface water and groundwater resources in the Gunnedah Basin district”. Our groundwater model confirms our proposed project will not have a negative impact on local water. Renowned water expert Dr Richard Cresswell who has studied water resources like the Great Artesian Basin for many years, has also stated that Santos will not impact the GAB and nor will we impact the water used by farmers and the community. If there was any question that we would have a detrimental impact on water, we would not go ahead with our project. It’s that simple. We are more than happy to answer any question and to show members of the community around our operations. What we often find, is that when people see our activities first hand and we explain how we work, they become comfortable with the processes and safeguards involved in natural gas extraction. I am very proud of the work that we do near Narrabri. Every day our team works diligently and professionally towards developing much needed natural gas for NSW.